Once a month, I get together with this super-fun group of wine lovers for dinner. 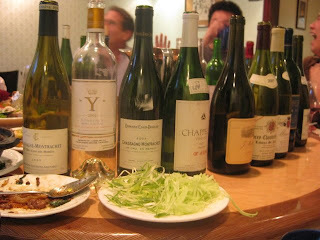 We met at Duck House this time and had the wonderful duck and other Chinese dishes with so many great wines. There was no theme for the wines this evening. There were 14 of us, but we opened more than 20 bottles! Here is the list of some of the wines we had. 2005 Domaine Colin-Deleger, Chassagne-Montrachet, 1er Cru "En Remilly"
2007 Gerard Raphet, Gevrey-Chambertin, "Labaux St-Jacques"
2003 Alain Burguet, Gevrey-Chambertin, "Mes Favorites"
1996 Domaine Armand Rousseau, Gevrey-Chambertin, 1er Cru "Clos St-Jacques"
1997 Domaine Zind Humbrecht, Alsace Pinot Gris, "Clos Windsbuhl"
The list was a good mixture of French and California wines (except for Grange). Surprisingly, there was no Italian tonight.